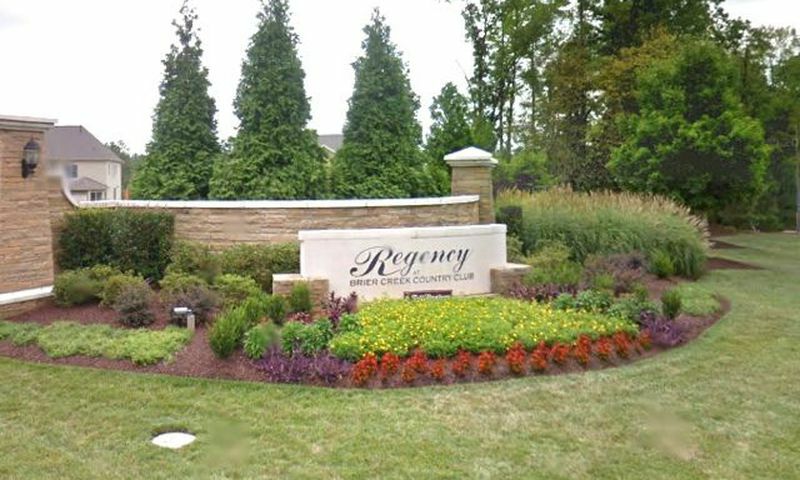 Regency at Brier Creek Country Club in Raleigh enjoys a prime location in the middle of North Carolina's popular Triangle area. The Regency neighborhood in the community caters to buyers looking for low-maintenance homes. These elegant ranch homes include desirable features such as spacious master bedroom suites and over-sized two-car garages. Regency is the neighborhood of the larger Brier Creek community. As such, Regency offers its homeowners access to all of the same amenities offered to those who live throughout Brier Creek. These spectacular amenities are centered on the 40,000 square-foot clubhouse and the 18-hole Brier Creek golf course. This championship course, designed by Arnold Palmer, provides challenging and flexible play with four sets of tees that allow players to stretch the course from 5,352 to 7,029 yards. Homebuyers will love the low-maintenance single-family homes found in the Regency neighborhood of Brier Creek. While the master-planned Brier Creek community will eventually have over 1,000 homes, the intimate Regency neighborhood includes 123 brick ranch homes, which range in size from 1,825 to over 3,000 square feet. These elegant homes are available in many different floor plans. Homeowners can choose from thoughtfully designed two, three and four bedroom models, to meet their own particular needs. The homes in Regency at Brier Creek offer many desirable features, such as gas log fireplaces and gourmet kitchens. Various floor plans include plenty of living space, including great rooms, Carolina sunrooms, covered porches, and optional basements. Buyers will particularly enjoy the comfortable eat-in kitchens, spacious master bedroom suites, and over-sized two-car garages. The Regency neighborhood within Brier Creek with homes designed for a low-maintenance lifestyle. This is an ideal situation for those buyers who like the idea of owning a low-maintenance home while still living amid the vibrancy of an active lifestyle community. There are plenty of activities available through the Brier Creek Clubhouse, including various programs that appeal to a wide array of homebuyers. Residents who choose to live at Regency at Brier Creek will be happy to know that The Triangle area also boasts excellent health care. While those who love to travel or have out-of-town guests will enjoy the convenient access to the Raleigh Durham International Airport. Regency at Brier Creek is a wonderful active lifestyle community in Raleigh, North Carolina. Brier Creek Country Club - 40,000 Sq. Ft. There are plenty of activities available in Regency at Brier Creek. Here is a sample of some of the clubs, activities and classes offered here. The Regency Collection includes five models that has between 1,825 and 2,048 square feet of living space. These homes are complete with at least two bedrooms, two bathrooms, and include an attached two-car garage. The Executive Collection offers nine models that have three to five bedrooms, up to three-and-a-half bathrooms, and an attached two or three-car garage. These homes are between 2,035 and 3,680 square feet in size. 55places.com is not affiliated with the developer(s) or homeowners association of Regency at Brier Creek. The information you submit is distributed to a 55places.com Partner Agent, who is a licensed real estate agent. The information regarding Regency at Brier Creek has not been verified or approved by the developer or homeowners association. Please verify all information prior to purchasing. 55places.com is not responsible for any errors regarding the information displayed on this website.